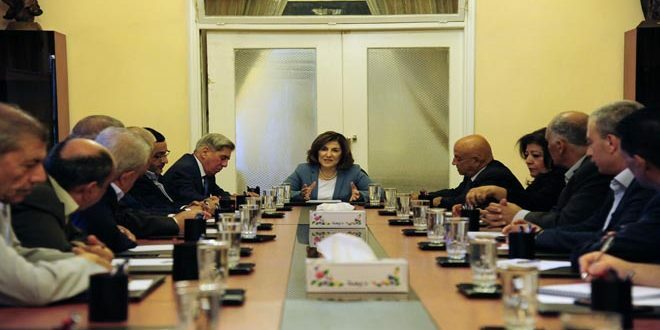 Presidential Political and Media Advisor Bouthaina Shaaban met on Sunday a Jordanian delegation, headed by the Assistant Secretary General of the Union of Arab Lawyers Samih Khreis. During the meeting, Shaaban affirmed that the delegation’s visit at this time is a healthy step on the road towards building an integrated Arab project. In turn, Khreis said Syria has been an example for steadfastness and resistance. In a press statement following the meeting, Shaaban said that Arab delegations’ visits to Syria confirm that the Arab people separate themselves from their governments. The delegation includes members of the Arab Lawyers Union, university professors, former members of the Jordanian parliament and Jordanian media and political figures.